Please join us for a Paint Day in the hall/basement of St. BONIFACE Church in Zurich. We will be painting the sunflower picture, guided step by step by talented artists from Brushstrokes in Motion. NO EXPERIENCE is necessary! The cost is $45, which will include everything to create your masterpiece on a 16 x 20" canvass. 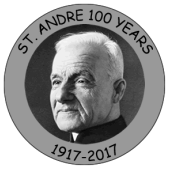 This event is a fundraiser for the Saint Andre celebrations taking place later this summer in St. Joseph. $15 from each ticket will go towards the celebrations!